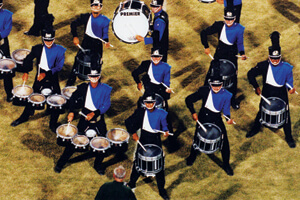 The 2000 Drum Corps International World Championships ended up at the University of Maryland's Byrd Stadium after originally being scheduled for what is now known as FedExField, 10 miles away. This was the first season that any-key brass instruments were allowed by DCI rules, though only the Blue Devils and Cadets left behind the world of G bugles, opening the door for most other corps to follow suit the next year. Other firsts included a separate judging caption for color guard that counted toward each corps' final score, and the availability of corps performances on DVD. There were a number of notable placement highlights: It was the third time in five seasons that the top two corps tied for the title, with the Cadets and Cavaliers sharing the honor. Boston Crusaders, in only its second year as a finalist corps, rocketed into 5th place for the corps' 60th anniversary. Blue Knights finished in 6th, their highest placement ever, and Southwind came within two tenths of a point of knocking the Bluecoats out of the Finals competition. Eight of 12 finalist positions were decided by margins of 0.40 or less. Wildly vibrant flags accompanied Blue Knights' 2000 production, "Colors of Brass and Percussion," based on two brass band works by Peter Graham. Scottish composer Graham was a student of Edward Gregson, whose music was featured in the corps' show of the year before. He is known for his works for British-style brass bands as well as concert bands, with his "Harrison's Dream" being one of the most performed contemporary works for advanced concert bands. The opener of "Montage" was originally a three-movement symphony; each movement evolving out of musical forms popular in the 16th and 17th Centuries. The opening intrada (a musical introduction popular during that earlier time period), introduced the main thematic material that was based on the musical interval of a minor third, which is typically rather somber sounding. Facing backfield, the opening moments had the corps spread across the entire field, the color guard members dancing without any equipment. A loud fanfare then interrupted the mellowness, introducing wildly psychedelic hand-painted flags of blues, maroons and yellows in abstract hard-edged shapes. The second half of the corps' opening production went straight into the third movement of the work; a main theme heard repeatedly in between contrasting motifs. Subdued flags were hand-painted in a variety of rustic earth tones, accompanying horn players who executed a variety of squats and lunges that would become increasingly prevalent in later Blue Knights programs. A variety of emotions explored three movements extracted from "The Essence of Time," based on a famous section from the Old Testament book of Ecclesiastes, Chapter 3, which in part reads, "There is a time for everything, and a season for every activity under the heavens." The chapter then goes on to list a variety of things, each beginning with the words, "a time to." The segments the corps chose commenced with "A Time for Love," sans drums, with some color guard partnering and the brass players clustered in pods during a standstill as the melody wafted toward the audience. "A Time for Hate" was slightly jazzy with a Latin tango flavor, dissonant chords violently echoing between sections of horns. The entire color guard worked with sabers for the beginning, later moving to flags that appeared to be a sort of solid lime green. As "A Time for Peace" started, it became apparent the flags were comprised of subtle variations of lime green delicately etched horizontally across the silks. This was the one segment of the show that was totally peaceful and traditionally melodic. The show ended with the very end of "Montage," tying all the themes together. The color guard rifles in front and the muted-color flags in back were dropped so the guard members could pick up matching hand-painted flags that were vaguely reminiscent of the colors at the start of the show. But instead of the hard-edged shapes of the beginning flags, these colors were layered in feathered strata. A large open triangle of horns dissipated into a series of rapidly changing geometric lines, collapsing at the end into a solid parallelogram for the final blast. For this week only, you can save on the DVD that contains this complete Blue Knights performance, along with all of the finalist corps at the 2000 DCI World Championship. Buy the 2000 DCI World Championship DVD set. (Available this week only for 20% off. Regular price: $45.95.) Discount DVD offer ends Monday, April 15 at 8:30 a.m. ET.